If you have purchased TV shows or movies from iTunes Store, and you would like to extract MP3 audio so that you can listen it anywhere or set it as ringtone. What shall you do? That's quite easy for you with the help of the M4V Converter Plus for Mac. It is an all-in-one program to remove DRM from iTunes videos and convert M4V to MP3, AAC and other audio / video formats. 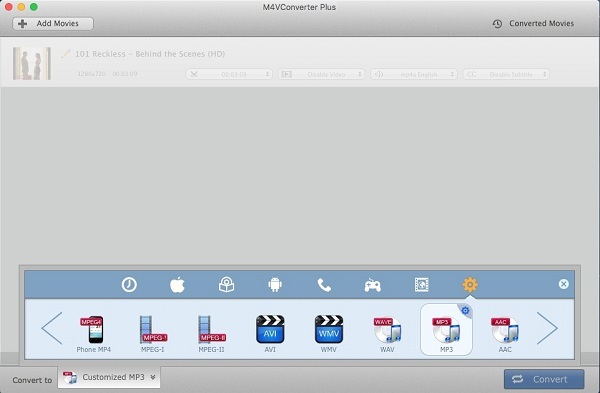 M4V Converter Plus is a professional M4V to MP3 converter, which allows you to extract audio from iTunes movies, TV shows and music videos and save as MP3 format without wasting time and losing quality. It can also support batch conversion. You can also set the Begin time and End time with ID3 Tags preserved. If you want to convert iTunes DRM-ed M4V to MP3 audio, please free download M4V Converter Plus now. The following guide is to tell you how to convert M4V to MP3 on your Mac ((including OS X El Capitan 10.11.x))at will. You can also extract MP3 audio from iTunes movies on Windows platform with right version. Step 1. Add iTunes M4V files to the program. Install the application on your Mac and open it. Click the Add Movies button to find the M4V files you want to convert from iTunes library, then hit Add. 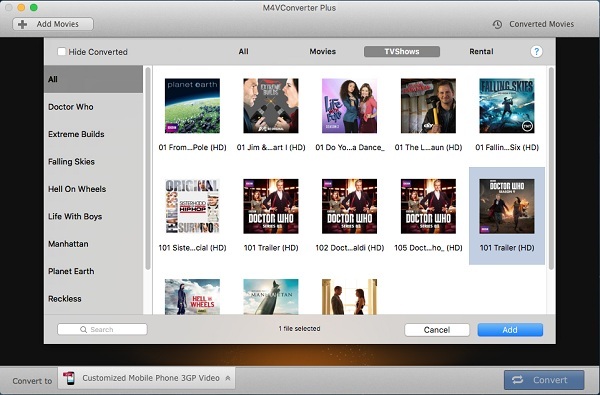 M4V Converter Plus can support converting any iTunes videos, including iTunes movie purchases & rentals, TV shows and music videos. Step 2. Select MP3 as target output format. Once the iTunes videos imported, hit on Convert to drop-down menu and choose Customized MP3 as output audio format. Step 3. Start converting M4V to MP3. 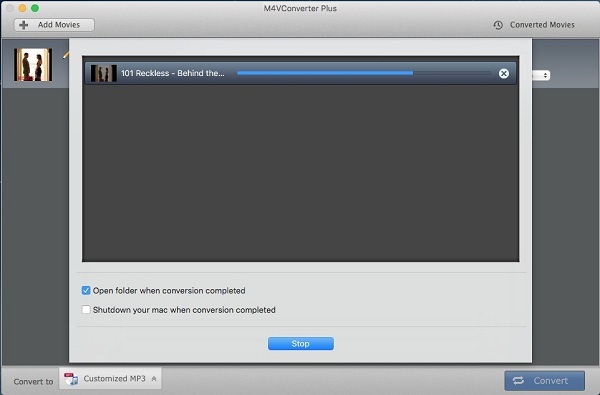 Last, but not least, click Convert button, the program will convert M4V videos automatically to MP3 audio.